During the weekend before my birthday in November, fellow shaman Nicholas Breezewood, who is editor of Sacred Hoop, notified many of us of an amazing opportunity. The Garchen Buddist Institute, located in Arizona, was hosting H.E. Garchen Rinpoche himself, and facilitating a Diamond Phurba Empowerment and Drubchen. And for those of us not local to AZ, it was also being broadcast live over the internet! I have worked with phurbas in my shamanic practice for a few years. I was gifted one from Caroline during my studies as her apprentice in Gryphons Grove, and received another (that practically jumped into my hand!) while shopping at Bell, Book, & Candle. Of course, I am not Tibetan, nor Buddhist, but I Journeyed to meet the Spirit of Phurba, and got a very strong presence in both of them! Phurbas are unlike many other shamanic tools that I work with; they have spiritual consciousness upon being forged, and they are Ready To Work. So even though there were numerous obstacles for us to overcome (language barrier, lack of cultural knowledge, different symbol sets), the Phurbas wanted to work with me. I was given specific instructions for how to use them, and how to store them between appointments. There were some difficulties in translation, as they gave me images in my head that I didn't quite understand, but after reading about them in the Encyclopedia of Tibetan Symbols..., it became a little clearer. However, even though I respectfully request their help in each shamanic session, there are still times in which I am unable to understand what they want me to do, or how they communicate via specific symbols. I am sure they get just as confused and frustrated as I do, but our relationship is strong because they Want to do the work of healing others, removing blockages, and assisting with transmutation. So this is why I jumped at the chance for the empowerment. In the way that I understand magic and healing, I believed that the empowerment will facilitate greater communication, a more common symbol set, and stronger lines of energy between us. I made sure I had the perfect set-up from home! And it has! My first few healing appointments afterwards were amazing; the Phurbas quickly identified intrusions/blockages, "sucked" them up, and sent them to the Nagas for transmutation. Our shared symbol set in my head is becoming clearer, and I am better able to use my instincts in determining what They want for a particular client. I will never be as well-versed in their use as a Tibetan-trained phurba master, but they are satisfied with being able to do what we can, together, in Maryland! The weekend-long workshop was also beautiful and moving. Although H.E. 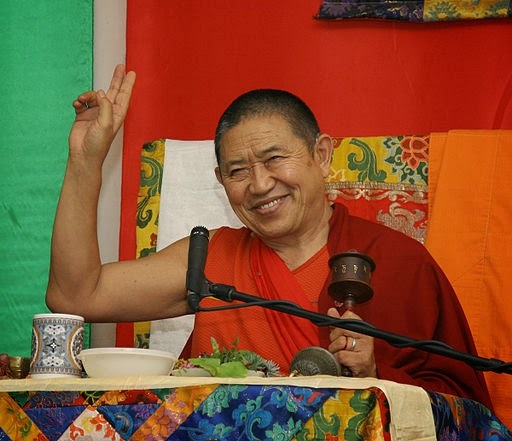 Garchen Rinpoche required a translator for his teachings, the genuine compassion and empathy in his words could be felt hundreds of miles away, even through an Ethernet cord. I felt so blessed after the ritual empowerment, and am so thankful for the opportunity to learn more about the Tibetan Buddhist/shamanic culture (within its own context, and not diluted/lost in translation). I know that I still have many things to learn, especially about Vajrakilaya and Mahakala (who have made Their presence known in dreams and Journeys)! How do you work with other cultures that are so different from your own? How do you work respectfully with new tool/concepts, and keep away from cultural appropriation? "How do you work with other cultures that are so different from your own? How do you work respectfully with new tool/concepts, and keep away from cultural appropriation?" Isn't that the question of the century? It depends on the object or concept. If for example we are dealing with a part from an animal native to North America, what I will find myself doing is not yoinking meaning from any existing culture, but journeying specifically to the spirit of that *particular* animal, and learning about it. What kind of personality it has, if it differs from other animals of the same type, and really becoming familiar with it's energy without influence of cultural tales and concepts. However, as a storyteller, I love learning about those things and enjoy the lessons they teach. It's a weird line to walk. I think that's an excellent way to do it! It also builds confidence in your own Journeying skills, because if you learn about a spirit in that way, and then check your info with research, sometimes they line up and it's awesome.